Mitt Romney and Jon Huntsman Jr. have both had to answer plenty of questions about Mormon doctrine during their presidential campaigns. One belief that particularly stands out to non-Mormons is the idea that men and women can progress eternally to become like God. In answering that question, Romney and Huntsman might well turn to the writings of Parley P. Pratt, who both share as a common ancestor. The informative and entertaining Parley P. Pratt & the Making of Mormonism illustrates that besides having a delightfully alliterative name, Pratt helped to develop the doctrine of men and women obtaining divine status, and arguably influenced early Mormonism more than anyone but Joseph Smith and Brigham Young. Of course, Romney and Huntsman may have also inherited the gene for explaining LDS theology from Pratt, since he led the way in the 19th century in writing tracts that expounded on the new faith for the uninitiated while also responding to critics. It’s an interesting example of how beliefs can flourish outside of the official LDS priesthood channels, but, unfortunately, that’s the only modern example included in Between Pulpit & Pew. Since the book is mostly written by history professors, much of what is covered occurred in the 19th century. There’s obvious merit in that subject, and people interested in LDS history will certainly enjoy this well-researched book. 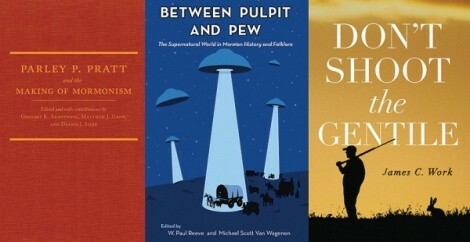 But, for many other readers, it may have been more interesting to have people from other fields—sociology, psychology, political science, etc.—look at how Mormon folklore originates and gets perpetuated in the age of Facebook and Twitter, how popular Mormon speaker and author Paul H. Dunn managed to pass off fiction as fact for decades, or why many conservative Mormons in the Legislature often seem to be at odds with the official church position on issues such as immigration, or workplace and housing discrimination against gays and lesbians. The way Mormon beliefs get sorted out can look strange to outsiders, as James Work recounts in his memoir, Don’t Shoot the Gentile. In the 1960s, Work was one of the only “gentiles”—non-Mormons—living in Cedar City while teaching at the College of Southern Utah (now known as Southern Utah University). Work has some amusing stories about the peculiarities of that time and place, such as how he would stop by the liquor store, show the state-issued license you needed at the time just to buy a bottle of wine, and load up his green station wagon with orders placed by various friends and associates who didn’t want to stop by the store themselves. He would park the loaded vehicle in his driveway with the doors unlocked, and the next morning it would be empty. Work also offers some heartwarming stories about how Mormons befriended him, and how anyone living in Cedar City at the time could count on the community to take care of them. Work’s various tales never really cohere into an overall theme, and his sense of humor runs into the incessantly corny grandpa variety. When he learns a young man is a returned missionary, he says, “I assumed the term ‘returned’ meant he had been sent back from some country demanding a replacement.” Such humor might be fun for a couple of hours when you see your grandpa at a family gathering, but you don’t necessarily want to go on a road trip with him for 15 hours—or 152 pages.